Microbeads are synthetic polymer particles that, at the time of their manufacture, are greater than 0.1 µm and less than or equal to 5 mm in size, which can vary in chemical composition, size, shape, density, and function. Microbeads are manufactured for specific purposes, including for use in personal care products (such as scrubs, bath products, facial cleaners, toothpastes). They may also be used in other consumer uses including cleaning products and printer toners and in industrial products such as abrasive media (e.g., plastic blasting), industry (e.g., oil and gas exploration, textile printing, and automotive molding), other plastic products (anti-slip, anti-blocking applications) and medical applications. Microbeads from ‘down the drain’ products will likely be released into the aquatic environment after wastewater treatment. Studies have shown that microplastics, including microbeads, are present in the environment and that they can reside in the environment for a long time. Microbeads have been shown to elicit both short and long-term effects in laboratory organisms. Based on the available information, it is recommended that microbeads be considered toxic under subsection 64(a) of the Act. This would enable appropriate preventative measures to be taken to reduce the release of microbeads into the environment. As a precautionary next step, the Government of Canada is proposing to add microbeads to the List of Toxic Substances under the Canadian Environmental Protection Act, 1999 (CEPA 1999). Plastic use continues to increase globally at a significant rate. Global plastic production has increased by 620% since 1975 and was estimated to be 288 million metric tonnes in 2012 (Jambeck et al., 2015). Due to long residence times in the environment (Andrady, 2011) and poor waste management practices, the environmental burden from plastic litter continues to increase globally (See Figure 1 below), posing environmental, economic and aesthetic issues with complex challenges and impacts (UNEP-IETC, 2012; Jeftic et al., 2009). Plastic waste entering water and marine ecosystems can come from various sources, the majority of which originate from land-based activities (GESAMP, 2015). Shoreline recreational activities, inadequate waste management and sewer infrastructure, additives in products, and uncontrolled releases from industrial and commercial activities have been cited as major causes of plastic pollution in the marine environment worldwide. These various sources can generate different types of plastics in the environment, from plastic bags and bottles to microplastics and microbeads. A graph displaying data that shows the release of plastics into the marine environment is expected to increase globally due to the mismanagement of plastic waste. Characterizing plastics and their potential effects on the environment is complex. Microbeads are manufactured with different sizes and shapes and are not comprised of a single chemical composition but a variety of compositions, the most common of which are polyethylene, polyethylene terephthalate, polypropylene, polyamide, polyesters, polystyrene, and polyvinyl chloride. They may contain residual chemicals from manufacture and pollutants adsorbed during different life-cycle stages (e.g., plasticizers, co-contaminants, etc.) (GESAMP, 2015; Browne et al., 2011; Eriksen et al., 2014). Once in the environment, plastics remain there for many years; for example, polyethylene and polypropylene added to the Bay of Bengal (a marine environment) to measure microbe-mediated biodegradation underwent less than 3% degradation after 6 months (Andrady, 2011). However, over time breakdown of plastics in the environment occurs through a variety of physical and chemical processes, such as weathering (e.g., wind and water erosion), hydrolysis with water, biodegradation, and photodegradation resulting in larger particles breaking down into smaller particles (Eriksen et al., 2014; Andrady, 2011). Smaller particles of plastics are broadly referred to as microplastics. The term was originally used to differentiate between larger plastics (macro) and those which can only be visualized with a microscope (micro). There is no agreed upon definition as to what constitutes a microplastic. Researchers have used definitions that are largely based on the sampling method used to characterize the microplastic they are investigating. For example, some researchers have used 500 µm and 67 µm sieves as the upper and lower limit for microplastics sampling, while others use less than 5 mm to 333 µm as the upper and lower limits based on the neuston nets used for their sampling (Andrady, 2011). More recently, a report from the United Nations’ Joint Group of Experts on the Scientific Aspects of Marine Environmental Protection (GESAMP, 2015) recommended a less than 5 mm to 1 nm definition (1 nanometer is one billionth of a meter). In addition, regulatory definitions for microbeads also vary; for example, the State of Illinois in the United States of America (USA) only provides an upper bound limit of less than 5 mm (See State of Illinois Public Act 98-0638 ), while the Canadian province of Ontario is considering microbeads with an upper bound size limit of less than 1 mm together with targeted uses in their proposed legislation (Bill 75, Microbead Elimination and Monitoring Act, 2015 ). Microplastics are organized according to their source, i.e. whether they are manufactured on the micrometer size or are the result of breakdown processes discussed above (such as weathering, photodegradation, etc.) (GESAMP, 2015). Microbeads are defined as synthetic polymer particles that, at the time of their manufacture, are greater than 0.1 µm and less than or equal to 5 mm in size. This includes different forms of particles including solid, hollow, amorphous, solubilized, etc. Secondary microplastics are synthetic polymer particles that originate from the breakdown of larger plastic items (Andrady, 2011). Microplastics include microbeads and secondary microplastics. A personal care product is defined as a substance or mixture of substances which is generally recognized by the public for use in daily cleansing or grooming. Depending on how the product is represented for sale and its composition, personal care products may fall into one of three regulatory categories in Canada: cosmetics, drugs or natural health products. The less than or equal to 5 mm cut-off is based on the upper bound limit used in research and by other jurisdictions and is indicative of expert opinion from a workshop on marine debris held in 2008 for secondary microplastics (Arthur et al., 2009). The lower bound of 0.1 µm was intentionally selected to remove nanoscale materials (those within 1-100nm). This cut-off was used: (1) to focus on industrially relevant microbeads; and (2) to differentiate between effects and properties unique to substances on the nanometer scale. This Science Summary Report focuses on microbeads and provides recommendations on microbeads only. For the purposes of this Report, information identified up to June 2015 was considered for inclusion in this Science Summary. Due to physical-chemical similarities, when studies specific to microbeads were not available, information on secondary microplastics was used as surrogate information. A review of scientific literature did not identify studies that indicated concerns for human health related to the presence of microbeads in personal care products. It is expected that microbeads present in personal care products applied to the skin are not absorbed by the body but rather rinsed off or leave the body when epidermal cells are sloughed off, and ultimately released to the environment (UNEP, 2015; Leslie, 2014; SNY, 2014). Although potential effects to human health through consumption of seafood containing microbeads has been flagged by some members of the public as a concern (UNEP, 2015) the limited information on this source of exposure does not indicate a basis for review of potential risk to human health from exposure to microbeads. Accordingly, the scope of this review is limited solely to environmental impacts. Microbeads are synthetic polymer particles manufactured for a specific purpose and application in the size range of greater than 0.1 µm – less than or equal to 5 mm. They can be composed of a variety of synthetic polymers depending on the required functionality. Table 1 lists the function of typical polymeric particulates found in personal care and cosmetic products (Leslie, 2014). In the case of microbeads, the most common polymers used are polyethylene, poly(methyl methacrylate), polytetrafluoroethylene, polypropylene, Nylon, and polyethylene terephthalate (Norwegian Environment Agency, 2014). Typical polymer forming reactions used to synthesize microbeads are based on the desired particle size (Jinhua & Guangyuan, 2014) and include emulsion polymerization (Chern, 2006; Asua, 2004), suspension polymerization (Brooks et al., 2010; Dowding & Vincent, 2000), and dispersion polymerization (He et al., 2011; DeSimone et al., 1994; Li & Armes, 2010). In addition, microbeads also contain residual chemicals as a result of their synthesis, such as unreacted monomers/reactants, petroleum-based chemicals, etc. These residual chemicals are different than environmental pollutants which adsorb onto the particle during its various life-cycle stages, especially within the aquatic environment (Mato et al., 2001; Teuten et al., 2007). Microbeads can vary in size, shape and density based on the chemical composition and method of synthesis (Napper & Thompson, 2015 in press). As can be seen from Table 2 (Hidalgo-Ruz et al., 2012), polymer particles (which include microbeads) can range in polymer densities from 0.9-2.10 g/cm3 (density of water at 25°C is approximately 1 g/cm3). In addition to polymer densities, the density of the entire particle will also be a function of other chemicals added during its manufacture (e.g., additives, fillers, etc). This variation in densities means that some synthetic polymer particles (including microbeads) will float on water surfaces and others may be present in the water column or settle to the sediments. Once in the environment, this behaviour will change depending on the aggregation/dis-aggregation and agglomeration/dis-agglomeration behaviour as the microbeads interact with environmental media, e.g., humic/fulvic acids. Moreover, synthetic particles (e.g., plastics) may become fouled by organisms and as a consequence, particles that initially floated may eventually sink to the sea bed. For example, substantial quantities of microplastics have been reported in deep sea sediments (Woodall et al., 2014). Data from a total of N = 42 studies. Due to the desired functionality of microbeads in a variety of personal care products, they can either be chemically and/or physically stable (e.g., when used as abrasives) or unstable (e.g., when designed to breakdown due to physical or chemical trigger to release other chemicals). Stable microbeads are most likely to persist in the environment. 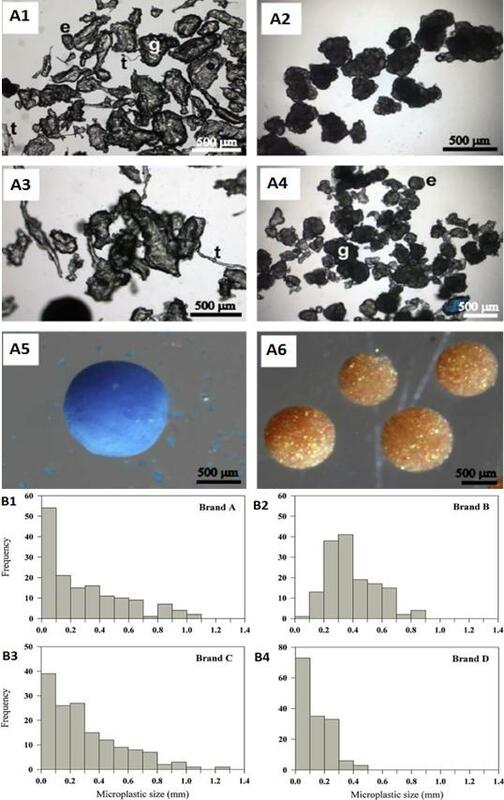 Figure 4 below shows examples of microbeads found in cosmetic products. The aggregation and/or agglomeration of the microbeads is apparent from the micrographs; however its relevance to environmental fate and effects is unknown. A figure that shows several images of plastic beads found in store-bought facial cleansers from New Zealand. The images were taken by a compound microscope and the plastic particles range in size from four micrometers to twelve hundred micrometers in diameter. Four graphs that display the size distribution of plastic particles from each of four store-bought facial cleansers. Globally, microbeads have been found to have use in personal care products, other consumer applications, and various industrial applications. Based on information presented in scientific literature considering personal care products, microbeads have been found in scrubs/peelings, shower/bath products, facial cleaners, creams, deodorants, make-up foundations, nail polishes, eye colours, shaving creams, bubble baths, hair colourings, insect repellants, toothpaste, eye shadows, blush powders, hairsprays, liquid makeups, mascaras, baby products, lotions, and sunscreens. Microbeads may also be found in other consumer uses/products including cleaning products and printer toner (Norwegian Environment Agency, 2014). Some products contain substantial quantities of microbeads. For example, Napper and Thompson (2015, in press) quantified microbeads incorporated in personal care products as exfoliants and showed that abundance varied considerably among products (137,000 – 2,800,000 per 150ml bottle). Some products that are used on a daily basis could result in release to household waste water of 94,500 microbead particles per application (Napper & Thompson, 2015 in press). In 2015, the Canadian Cosmetic, Toiletry, and Fragrance Association (CCTFA) voluntarily surveyed its members and shared summarized information with the Government of Canada. CCTFA information indicates that in Canada, microbeads were reported to be used in personal care product categories of skin care (which include anti-aging creams, moisturizers, cleansers, etc. ), bath and body (which include bath/shower gels or soaps, lotions, talcs or balms, nail polishes, etc. ), and cosmetic-like products, which include fluoridated toothpastes, acne therapy, etc. While the specific products were not reported, the total annual volumes of microbeads in Canada by individual CCTFA members ranged from 30kg/year to 68,000 kg/year. Microbeads are also used in industrial products such as abrasive media (e.g., plastic blasting at shipyards, productions facilities such as garment and car parts), industry (e.g., oil and gas exploration, textile printing, and automotive molding), other plastics products (e.g., anti-slip and anti-blocking applications) and medical applications (biotechnology and biomedical research) (Leslie, 2014; Norwegian Environment Agency, 2014). When used in personal care products, microbeads enter the environment primarily through effluent from wastewater treatment plants from ‘down the drain’ release of products. Secondary routes of entry into the environment include accidental spills and releases related to industrial applications (GESAMP, 2015). In a recent study by Talvitie and Heinonen (2014), a preliminary investigation on microplastics removal from the Central Wastewater Treatment Plant in St. Petersburg, Russia suggested that although treatment showed a high removal of microplastics from wastewater effluent (greater than 95 %) after secondary treatment, a number of particles do remain in the effluent and enter the aquatic compartment. The authors filtered purified effluent water with 300, 100, and 20 µm filters and identified fibers and particles as the primary microplastics in the incoming wastewater. These findings are consistent with a recent study in Paris, France by Dris et al., (2015) who found greater than 90% removal of microplastics after wastewater treatment. Specific to microbeads, New York State recently investigated a number of their wastewater treatment plants (WWTPs) and found that microbeads were present in the effluent of 25 of the 34 WWTPs sampled (New York, 2015). Thus, while additional studies are needed for microbead removal and transformations from wastewater treatment processes, microbeads are expected to be removed to a high degree but also will pass through WWTPs and enter the aquatic environment. Once in the aquatic compartment, the subsequent behaviour of microbeads depends on their physical-chemical properties. Microbeads, like other particles (Buchs et al., 2013; Dale et al., 2015; Syberg et al., 2015), will either interact with chemicals in the water column (e.g., sorb natural organic matter) and/or settle to the sediment. 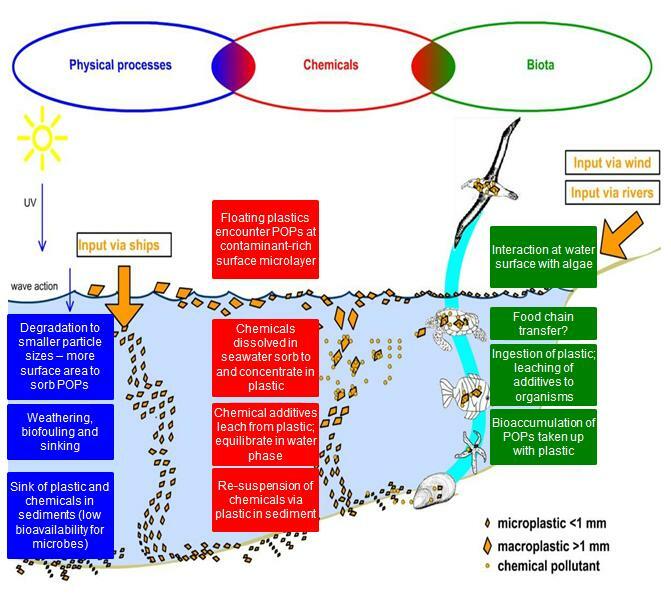 Figure 3 describes the processes that microbeads undergo after introduction to the aquatic environment. Once exposed, microbeads can undergo physical transformations (from mechanical degradation, weathering, etc.) and adsorb/desorb a variety of local pollutants (e.g., persistent organic pollutants such as polyaromatic hydrocarbons, polychlorinated biphenyls, etc.) from the surrounding environmental medium (Bakin et al., 2014; Teuten et al., 2009). Recent work has shown that microbeads extracted from cosmetic products have similar potential to adsorb persistent organic pollutants as reported for microplastic particles (Napper & Thompson, 2015 in press). In addition, interactions of microbeads with natural organic matter will have a strong impact on where they will finally reside in the water column. Microbeads with low densities, unless perturbed (e.g., by interacting with dissolved organic matter, other particulates, or micro-organisms), will float and be available to pelagic and avian species, while the denser microbeads in the water column are expected to settle over time. The denser microbeads will then undergo transformations (e.g. agglomerating/aggregating, increasing in size and mass after interacting with dissolved chemical species) and become available to aquatic benthic species. Therefore, microbeads are expected to be present in both the water and sediment compartments. A diagram showing possible entry routes of microplastics entering a body of water and probable destinations once introduced. The diagram is presented in a flow-chart format, beginning with vectors of microplastic input into the aquatic environment. It is shown that microplastics may be introduced to the aquatic environment through transport via river bodies, wind, or ships. The flow chart then presents biota-related, chemical-related, and physical process-related effects that microplastics will undergo upon entry into the water bodies. The figure shows that there is often a contaminate-rich microlayer at the surface of general bodies of water, and here floating microplastics are expected to encounter and adsorb any persistent organic pollutants that may be present. Chemicals dissolved in the water will also act to adsorb and concentrate onto plastic that is present. Further degradation by exposure to wave action and ultra-violet light will act to break up these plastics into ever smaller particles, consequently increasing their overall surface area and thus their ability to adsorb additional pollutants. At this stage, microplastics may also interact with algae on the surface or common aquatic life in the water column and uptake of the particles may follow. Over time, weathering, biofouling, and sinking of the suspended particles is shown to occur. Additionally, epipelagic organisms that ingest microplastics may subsequently be consumed by predators, potentially initiating food-chain transfer of the particles. Chemical additives used in the manufacture of the plastic will proceed to leach into the surrounding environment; which is depicted to either be the water body itself or potentially the G-I tract of an organism that has consumed such microplastic particles. The flow chart shows that the long term bioavailability of the particles and their contaminants depends on their ultimate fate. Low density particles will likely remain on the surface and continue to degrade, adsorb pollutants and potentially become ingested by aquatic organisms or birds. High density particles will sink to the sediment and the diagram notes that this will provide a low bioavailability to microbes. There would also likely be a re-suspension of chemicals into the surrounding water via the plastic present in the sediment. And there is also potential for the bioaccumulation of any persistent organic pollutants taken up with the ingestion of plastics in the food chain. There is very little known about the fate of microbeads (and secondary microplastics) in air. It is unknown whether microbeads, like other particulates (Quadros & Marr, 2010; Hennigan et al. 2011) with low relative densities can partition to the air compartment and, if they do, are they able to adsorb airborne pollutants and/or undergo long-range transport and atmospheric transformations (e.g., reactions with hydroxyl radicals) (Dellinger et al., 2001). In addition, fate in soil is also unknown for microbeads (and secondary microplastics). Based on one study at a municipal wastewater plant in Russia, microplastics, although not completely removed from the effluent, are expected to primarily partition to biosludge after wastewater treatment (Talvitie & Heinonen, 2014). Once in biosolids, microplastics have the potential to be present in soils should the biosolids be applied to land. Once in the soil, microbeads (Darlington et al., 2009) could be mobile (although this is expected to be unlikely) or immobile depending on the soil chemistry and the size of the microbead relative to the soil particulates (Bradford et al., 2002). In the environment it is extremely difficult to differentiate and discriminate between microbeads and secondary microplastics. As most studies report only total microplastic concentrations, it is not currently possible to quantify the contribution of microbeads versus all other plastic litter. The only study available on microbead contribution to plastic litter is by Gouin and colleagues (2011), who have conservatively estimated that the use of polyethylene microbeads in liquid soap alone resulted in the consumption of 2.4mg of polyethylene microbead per person per day, thereby emitting a total of 263 tonnes per year of polyethylene microbeads in the United States from liquid soap use. Due to the lack of data explicitly regarding microbeads, information on microplastics (which includes both microbeads and secondary microplastics) was used to highlight the presence of microbeads in the environment. Microplastics have been measured at almost every location on the globe, including waters, sediments, soils (Hall et al., 2015), deep sea sediment deposits (Woodall et al., 2014) and ice cores (Obbard et al., 2014). Figure 4 indicates concentrations of microplastics in sediment and surface waters from different regions. 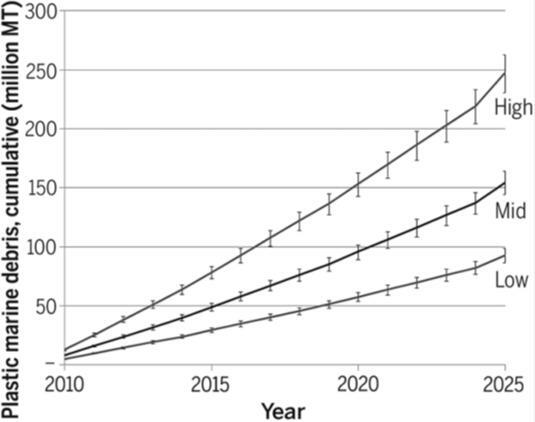 Several authors have suggested there will be a steady increase of marine litter (which includes microplastics) in the environment (Jambeck et al., 2015) over the next few decades (Figure 1). Law and Thompson (2014) have noted that even with the prevention of additional macroplastics into the environment, concentrations of microplastics will continue to rise due to fragmentation of larger plastics into smaller particulates (Law & Thompson, 2014). (A) A simplistic black and white map of the world with green circles of various sizes plotted on the locations of 18 different beaches around the globe. The sizes of the circles correspond to the number of microplastic particles found there per two hundred and fifty milliliters of sediment. The information relating the size of the circles to the respective microplastic concentrations that they represent is shown in a legend to left of the map. The legend presents four different circle sizes that reflect ranges of concentrations that are equal in magnitude. It shows that the smallest circles on the map represent the range of 1 to 10 microplastic particles per two hundred and fifty milliliters of sediment. The next three size ranges are 11 to 20, 21 to 30, and 31 to 40 microplastic particles per two hundred and fifty milliliters of sediment respectively. For the purposes of describing the plotted data, four tiers will be used to represent the plastic concentrations from smallest to largest and will be called levels 1, 2, 3 and 4. The shores that were sampled in this study and their associated data are given as follows. and an unspecified beach in Oman, level 2..
(B) A black and white map of the world showing concentrations of plastic debris measured in surface waters of the world's oceans. The data that is plotted on the map is done so via coloured circles of which their color and size indicate mass concentrations of plastic in grams per square kilometer. A legend in the top right corner of the image shows six ranges of concentrations and a corresponding coloured circle that represents each concentration. At zero plastic concentrations a small colourless circle with a blue border is used. From 0 to 50 grams per square kilometer a small blue circle is used. From 50 to 200 grams per square kilometer, a small green circle is used. From 200 to 500 grams per square kilometer, a small yellow circle is used. From 500 to 1000 grams per square kilometer, a medium sized red circle is used. And from 1000 to 2500 grams per square kilometer, a large, dark red circle is used. The data shows average concentrations in 442 sites around the world, and was collected via 1,127 total surface net tows. According to the image relatively low average plastic concentrations of 0 to 50 grams per square kilometer labelled with small blue circles are present near virtually all global shorelines. The data tends to show however that high concentrations of debris appear to gather in large accumulation zones in the middle of the oceans. These areas are marked on the image as patches of light and dark grey, indicating the outer and inner accumulation zones respectively. These zones in this image are produced from a global surface circulation model, and they correspond with the world’s primary oceanic gyres. These gyres include the North and South Atlantic gyres, the North and South Pacific gyres and the Indian Ocean gyre..
Microplastics have been measured in Canadian waters and sediments. Desforges et al. (2014) found microplastic (ca. 70% microfibers and 30% pellets ranging in size from 64.8 μm to 5810 μm) concentrations ranging from 8 to 9200 particles/m3in sub-surface seawaters of the northeastern Pacific Ocean and coastal British Columbia. Microplastics have also been measured, primarily as fibers, in Nova Scotia beach sediment at concentrations of 20-80 microplastics/10g sediment (Mathalon & Hill, 2014). In another study by Obbard et al. (2014) microplastic concentrations of 30-234 particles/m3 of ice were found from ice samples during two Arctic expeditions in the Beaufort and Chukchi Seas. In their study, Obbard and colleagues (2014) identified microplastics of rayon (54%), polyester (21%), nylon (16%), polypropylene (3%), polystyrene (2%), acrylic (2%), and polyethylene (2%) with sizes ranging from 0.02 mm to 2 mm. Microplastics have also been measured in freshwater systems, for example in the St. Lawrence River microplastic median concentrations were 52 microplastic/m2 (primarily polyethylene with sizes ranging from 0.4 to 2.16 mm) after sampling across 10 freshwater sites (Castañeda et al., 2014). Similarly in Lake Superior, Lake Huron and Lake Erie average abundance of microplastics was found to be 43,157 particles/km2 with sizes ranging from 0.355 mm to greater than 4.75 mm (81% of the microplastics were in the 0.355-0.999 mm fraction) (see Figure 5 below for distribution) (Eriksen et al., 2013). The differences in units used to report microplastics concentrations in the environment are primarily due to the different methods used to sample microplastics (Andrady, 2011) and lack of adequate quality control (e.g., lacking standard reference materials and proficiency testing). These differences limit the comparability of values across different studies. Plastics, including microplastics, have also been measured on Canadian beaches of Lake Huron (at concentrations of 38 particles/m2) (Zbyszewski & Corcoran, 2011), Lake Erie (ranging from 0.36-1.78 pieces/m2), and Lake St. Clair (ranging from 0.18-8.38 pieces/m2) (Zbyszewski et al., 2014). 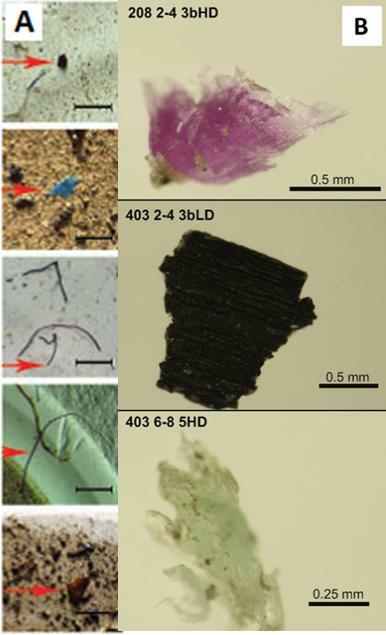 In their study, the authors mainly found microplastics composed of polyethylene and polypropylene sorted in size fractions of less than 5 mm and greater than 5 mm. Recently, plastic debris (primarily microplastics) have also been measured on beaches of Humber Bay at concentrations of 16.3 pieces/m2fractionated by less than 1cm (55 fragments/48g total mass), 1-5cm (321 fragments/122.90g total mass), and greater than 5cm (29 fragments/47.60g total mass) (Corcoran et al., 2015). Thus, it is evident that microplastics are present across Canada in freshwater and saltwater ecosystems, and as evidenced by Figure 5 below, microbeads are also present together with microplastics (suggesting similar fate and behavior). (A) A map showing the distribution of microplastics in the Great Lakes. This map includes data for Lake Erie, Lake Superior, Lake Michigan and Lake Huron, but not Lake Ontario. From this data set, the highest numbers of microplastics were found in Lake Erie. (B) Scanning electron microscopy image of a spherical plastic fragment found in one of the Great Lakes. Microplastics are accumulating in the environment. In a recent paper by Obbard and colleagues (2014) microplastics were measured in frozen ice cores of the Arctic Ocean in 2010. The authors confirmed that these microplastics have accumulated far from population centers and suggested that polar sea ice is becoming a major sink for microplastic contamination and, as the ice melts, these microplastics can be released into the environment. In addition, a recent study by Corcoran and colleagues (2015) have found that microplastics have been accumulating in sediment cores of Lake Ontario (10.5 pieces/m2) for the past 38 years. Similarly, in work by Thompson and colleagues (2004), plastic fibers have been measured in archived plankton samples dating as far as the 1960s and trend data indicates a significant increase in plastic fragment abundance over time (primarily fibers of approximately 20μm in diameter), further confirming that the accumulation of microplastics is increasing in places in the environment (Thompson et al., 2004). (A) Images of ice core samples from the Arctic Ocean that were found to contain microplastics. (B) Three images of millimeter sized plastic particles found in sediment cores of Lake Ontario. Uptake: Microbeads are readily taken up by a variety of organisms including fish, mussels, and several types of zooplankton (Imhof et al., 2013). In this study, microbeads were found in the gut of the tested organisms (e.g., Daphnia magna, Lumbriculus variegatus, Notodromas monacha, etc.) and most organisms removed microbeads overtime through faeces (up to 96% microbeads found in faeces with no measurable effects). Translocation: Microbeads translocation from the gastro-intestinal tract into the organism has also been confirmed; for example Rosenkranz and colleagues (2009) found rapid uptake and depuration of microbeads in Daphnia magna but also found the presence of microbeads in the Daphnia lipid storage droplets. In addition, Von Moos and colleagues (2012) found that microbeads can also be internalized from tissues into cells by measuring the presence of microbeads in the intestine, lumina of the digestive gland, and digestive epithelial cells of blue mussels. Food-web transfer: Setälä and co-workers (2014) have shown that microbeads can transfer across food-webs by feeding microbead-containing zooplankton to mysid shrimp and confirming presence of the beads after 3 hours of incubation. Long-term impacts: There is a paucity of information on long-term effects of microbeads. A multigenerational study in copepods conducted by Lee et al. (2013) found that 0.5 μm polystyrene microbeads caused mortality of nauplii and copepodites in the first generation at a concentration of 12.5 μg/mL and in the second generation at 1.25 μg/mL. In the same study, developmental delay was measured at 25 μg/mL for 0.5μm microbeads. Direct effects: Nobre (2015) have noted direct effects in a 24 hour study on the embryonic development (likely from residual chemicals in the microbead during production) of sea urchins exposed to as-produced and beach-sourced microbeads (20% by volume microbeads). In a 9-day study by Cole and co-workers (2015) in copepods, impedance of feeding behaviour led to decreased reproductive output. Similar findings have been shown recently in Hyalella azteca with decreased body growth and reproduction due to feeding impedance. These authors calculated 10 day-LC50’s of 4.64 × 104 microbeads/mL for spherical polyethylene microbeads and 71.43 microbeads/mL for fiber microbeads (Au et al., 2015). Another study regarding impacts on feeding behaviour by Carlos de Sa (2015) indicated a color-specific uptake where red and black microbeads significantly impeded feeding behaviour relative to white microbeads. Cellular and sub-cellular effects: Rochman and colleagues (2013) found that microbeads with and without pollutant adsorption caused stress in liver as determined by glycogen depletion, fatty vacuolation, and single cell necrosis in Japanese medaka. In a follow-up study by the same authors (2014) in the same organisms, and following 2-month exposure from plain and pollutant-modified microbeads, there was altered gene expression in male fish (from pollutant-modified microbeads) and female fish (from both modified and unmodified microbeads). They found significant down regulation of choriogenin gene expression in males and significant down regulation of vitellogenin, choriogenin, and estrogen receptor alpha in females. These findings suggest the capability of inducing an endocrine-disrupting effect both from modified and unmodified microbeads. However, it is unclear in this study whether the effects from the unmodified microbeads were from only the particle and/or residual chemicals from manufacturing. In a study by Avio and colleagues (2015), both unmodified (virgin) and pyrene-modified microbeads led to DNA damage in mussels, suggesting possible genotoxicity. Transport of pollutants: Multiple studies have shown that microbeads can adsorb pollutants from the environment and desorb them in the organism. For example, Rochman and colleagues (2013) exposed Japanese medaka to microbeads modified with polyaromatic hydrocarbons (PAHs), polychlorinated biphenyls (PCBs), and flame retardants (PBDEs) and found that in all cases an increase of pollutants was found inside the fish relative to concentrations in the test media. In another study by Brown et al. (2013) in lugworms, it was found that although microbeads adsorb and desorb pollutants (including nonylphenol, phenanthrene, triclosan, and PBDE-47), silica particles (sand) were found to release higher concentration in the gut tissue, suggesting that more information is needed to understand the significance of microbead transportation of pollutants versus naturally available particulate matter in organisms. Recent work has shown that microbeads extracted from cosmetics have similar potential to adsorb and hence transport chemicals to that previously demonstrated for microbeads and secondary microplastics (Napper & Thompson, 2015 in press). Fluorescently tagged microbeads were measured in the gut of the exposed organisms (ranging from 32.4±3.8% in Notodromas monacha to 93 ± 0.07% in Lumbriculus variegatus), in intestines of Daphnia magna, and in the faeces (up to 96 ± 0.03% in Gammarus pulex) thereby indicating active uptake of microbeads into organisms. Fluorescently labeled microbeads accumulated in the GI tract (within 60 minutes) reaching a maximum concentration of ca. 700 times greater than media concentration. Particles underwent relatively rapid depuration and particle concentration decreased by over 90% over 240 minutes. In addition, microbeads were also measured in the specimen’s lipid storage droplets, indicating translocation. Acute exposures (10 day) to daphnia Hyalella Azteca resulted in increased ingestion of microbeads with increasing microbead concentrations. In chronic exposures size selective uptake of microbeads was seen as the organisms grew, suggesting that as the organisms grow larger they may prefer larger particulate matter and ingest fewer microbeads. No translocation from the gut was measured in this study. During acute exposures (10 day), polypropylene microfibers were found to be more toxic than the spherical beads decreasing growth of the organisms. In chronic exposures (42 day) to polyethylene microbeads resulted in growth reductions and reproduction likely due to the reduced food intake when microbeads are present. 10-d LC50s for polyethylene spherical and polypropylene fiber microbeads were 4.64 X 104 microbeads/mL and 71.43 microbeads/mL, respectively. Fluorescently-tagged polystyrene microbeads (10μm), polystyrene plastic fragments (1-100um) and polyacrylic fibers (20-2,500um). Isopods were fed 12 or 120 microbeads/mg, 20 or 350 fragments/mg, and 0.3mg fibers per g food. Isopods did not distinguish between food with and without fluorescent microplastics. Microplastics were found primarily in the gut. No aggregation was observed. 3.5 microplastic particles were detected per mg stomach tissue. less than 1 particle/mg tissue detected in midgut gland sample. There was no impact on survival, intermolt duration, and growth in the exposed isopods. Uptake of microbeads was seen in all organisms. Food web experiments with microbead enriched zooplankton fed to mysid shrimp confirmed the presence of microbeads in mysid intestine after 3h incubation. Two month exposure from plain and POP-modified (PAHs, PCBs, and PBDEs) microbeads was conducted in fish. Following exposure, an increase in the concentration of PAHs, PCBs, and PBDEs was found in the fish. In addition, stress was measured in the liver of the fish in both plain and POP-modified treatments as determined by glycogen depletion (seen in 46% and 74% of the fish after unmodified and POP-modified microbead exposure, respectively), fatty vacuolation and single cell necrosis. Two month exposure from plain and POP-modified (PAHs, PCBs, and PBDEs) microbeads was conducted in fish. Altered gene expression was observed in male fish exposed to POP-modified microbeads and gene expression was observed in female fish for both unmodified and POP-modified microbeads. Significant down regulation of choriogenin (Chg H) gene expression in males and significant down regulation of vitellogenin (Vtg I), Chg H and estrogen receptor alpha (ERα) was measured. In addition, histological observation revealed abnormal proliferation of germ cells in one male fish exposed to POP-modified microbeads, Down-regulation of Chg H in fish fed the virgin plastic treatment suggests that the plastic particles are capable of inducing an endocrine-disrupting effect. 420-500 μm polyethylene microbeads (white, black, and red) at 30 particles/treatment. Each treatment took place in 300mL of artificial sea water. Differences were noted in feeding behaviour when fish from different sources were fed microbeads in combination with natural feed. In addition to being able to differentiate between microbeads and natural feed, predatory performance was significantly reduced of fish in the presence of black and red microbeads, while predatory efficiency was reduced with all microbeads indicating a direct impact of exposure to feeding ability. Some organisms were found to ingest microbeads preferentially over sand particles. In addition, the study may indicate shape-dependant uptake of microbeads through feed. The survival of T. gratilla larvae was not significantly impacted by exposure to microspheres after 5 days. However, larvae that were exposed to the highest concentration had smaller body widths. Other characteristics (abnormality, body length, larval asymmetry) were not affected by exposure to microbeads. Microbeads modified with environmentally relevant pollutants (nonylphenol, phenanthrene, Triclosan, and PBDE-47) transferred these pollutants into the gut tissue of lugworms, although silica (sand) was found to release a higher concentration of these pollutants into gut tissues. Effects of these transferred pollutants resulted in reduced survival, feeding, immunity, and antioxidant capacity. In addition, microbeads without added pollutants led to greater than 30% decrease in the ability to deal with oxidative stress. Lugworm survival was 94% after 28 day exposure period. No microbeads were found in organisms which survived the entire exposure period. The worms ingested the polystyrene microbeads but these did not accumulate in the organism. HDPE microbeads were found on gills and inside the digestive system. Transfer into the mussels was facilitated via microvilli and cilia movement. Exposure to the microbeads induced a significant increase in granulocytoma formation (after 6hours) and a decrease in lysosomal membrane stability (more apparent after 96hours). Mechanism of toxicity suggested is: (1) particle ingestion (within 3 hours of exposure), granulocytoma formation (after 6 hours), and lysosomal destabilization at the cellular and subcellular level. Microbeads were found in the intestine, in the lumina of primary and secondary ducts of the digestive gland, and in endocytotic vacuoles of digestive epithelial cells indicating that microbeads can be internalized into cells. less than 100 μm polyethylene (PE) and polystyrene (PS) microbeads. Mussels were exposed separate treatments of virgin and pyrene-adsorbed beads of both plastic types at a nominal concentration of 1.5 g/L. Microbeads with 200-260 ng/g of adsorbed pyrene were fed to mussels accumulated in tissues. No differences due to chemical composition were seen in the results suggesting effects were driven by physical properties of the microbeads. Histological analyses of treated mussels revealed the presence of microparticles in haemolymph, gills and, especially, in digestive glands where numerous aggregates could be observed in the intestinal lumen, epithelium, and tubules. In digestive glands, concentrations of pyrene were up to 13 folds higher than the control suggesting an elevated desorption and bioconcentration process of pollutants absorbed on microbeads. In addition, biomarkers indicated effects at the cellular level and sub-cellular level. Genotoxicity was measured in the mussels with DNA damage higher in organisms exposed to unmodified microbeads and nuclear alteration seen in both pyrene-modified and unmodified microbeads. Relatively pure microbeads and microbeads from a beach source (presumably microplastics) both showed adverse effects on embryos of sea urchin, leading to increased anomalous embryonic development. Adverse effects for the pure microbeads were attributed to residual chemicals from the manufacturing process (these beads were sourced from a petrochemical factory), while for the beach sourced microbeads adsorbed pollutants were expected to be the cause of adverse effects. Prolonged exposure (9 days) to polystyrene microbeads resulted in decreased reproductive output (possibly due to impedance of copepod feeding behaviour), but no significant differences between the control in egg production rates, respiration, or survival. 0.05, 0.5 and 6 μm polystyrene beads tested at concentrations of 0, 6, 13, 31, 63, 187, 250, and 313 μg/mL. In a two generation toxicity test, the nauplii died within approximately one week after being exposed to PS beads at greater than 12.5 μg/mL in the F0 generation and greater than 1.25 μg/mL in the F1 generation, before the metamorphosis into copepodids. In the two-generation test, high concentrations of 0.5-μm PS beads were found to have caused increased toxicity and had impacts on the survival and development of copepods in the F1 generation. Despite the potential for ingested PS beads to be transferred from mother to offspring, fluorescent beads were not observed in eggs while in the ovisac. Since microbeads and secondary microplastics both have similar physical-chemical properties and similar fates (i.e., long residence time), information on presence in different organisms has been summarized below for secondary microplastics and can be used as surrogate for microbeads. Secondary microplastics of an assortment of shapes (fibers, spheres, irregular shapes, etc.) and sizes have been found in a variety of birds, including Laysan Albatross, Wedge-tailed Shearwaters (Fry et al., 1987), Black-browed Albatross, Atlantic Yellow-nosed Albatross, White-chinned Petrel, Spectacled Petrel, Great Shearwater, Manx Shearwater, Cory’s Shearwater Antarctic Fulmar (Colabuono et al., 2009), Southern Fulmar, Cape Petrel, Snow Petrel, Antarctic Petrel, and Wilson’s Storm (van Franeker & Bell, 1988). Regarding mammals, a few studies measured the ingestion of secondary microplastics in seals, whales and sharks. Eriksson and Burton (2013) found secondary microplastics of many sizes, colors, and shapes in Antarctic fur seals. The composition of the secondary microplastics found were polyethylene, polypropylene, polyethylene terephthalate, polystyrene, casein, and polyester resin. This same study also indicates food-web accumulation by feeding of secondary microplastics contaminated pelagic fish by fur seals (Eriksson & Burton, 2013). In addition, secondary microplastics have also been measured in baleen fin whales (Fossi et al., 2014), basking shark, and humpback whales (Besseling et al., 2015). A large body of studies focused on the ingestion of secondary microplastics in aquatic species including fish (Dantas et al., 2012; Foekema et al., 2013; Lusher et al., 2013; Possatto et al., 2011), lobster (Murray & Cowie, 2011), freshwater and marine mussels (Leslie et al., 2013; Van Cauwenberghe & Janssen, 2014), common periwinkle, oyster, crabs, and amphipods (Leslie et al., 2013). Differentiation and quantification of microbeads in the environment relative to secondary microplastics is lacking. Infrared spectroscopy is commonly used to measure environmental concentrations, but it does not provide the resolution to differentiate between microbeads and secondary microplastics in environmental samples, and as such it is not possible to predict distinct environmental concentrations of microbeads alone. Due to the different techniques for collecting environmental samples of microplastics, (e.g., 333 µm cut-offs when using neuston nets (Andrady, 2011)), microbead concentrations and quantities in the environment may be under-reported. In addition to the limitations with size-selective sampling methodologies, sampling requires a visual step to discriminate between synthetic particles and the natural background (sediment, plankton). During this stage brightly colored and differently shaped (fibrous rather than round) particles are more likely to be recovered. Hence microbeads, particularly those that are white or translucent, are likely to be underrepresented in environmental samples. Also, the extraction is generally done only on the top layers of the water column or the sediments. However, microbeads can have different densities such that they are dispersed throughout the water column and may not be collected during environmental sampling. From the information gathered for this summary, it was apparent that understanding on the behavior in soil and air compartments is lacking. Although there is currently a limited understanding of the behavior of microbeads in the water compartment (through principles for particulate colloids), there is no information on behavior in the air and soil. It is not known if microbeads will be present in ambient air or whether they may undergo long-range transport. Similarly, it is not known how microbeads will behave once in soils after aging and coming into contact with natural organic matter and soil pore-water. Linking effects in organisms to microbeads remains a challenge since some microbeads incorporate residual chemicals from their manufacture, and these may be eliciting separate effects relative to the microbead particulate. A step-wise investigation is needed to allow delineation of these effects under environmentally relevant conditions. However even in the absence of this data it can be assumed that all observed effects are relevant regardless of whether the microbead itself or its associated residual chemicals are the driver of such effects, as they are released into the environment together. While no size-dependent effects were noted from the literature review, it is unclear whether microbeads approaching the smaller size scale, i.e., the nanometer scale, will exhibit different or enhanced reactivities and/or effects. The concentrations of microplastics are expected to increase significantly in the environment due to the expected linear increase in mismanaged macro plastic debris from increased use of plastics over the next decade (Jambeck et al., 2015) and fragmentation of existing macro plastic debris (Law & Thompson, 2014). According to a recent study by Eriksen and colleagues (2014), there are approximately 5.25 trillion plastic particles weighing 268,940 metric tonnes currently floating at sea. Of this, microplastics are predicted to account for 92.4% of the global particle count. Microbeads are a contributor of plastic litter in the environment. The continued use of microbeads will result in increased presence in the environment. In laboratory studies, microbeads have shown adverse short-term and long-term effects in aquatic organisms. Microbeads may reside in the environment for a long time and continuous release of these substances to the environment may result in long term effects on biological diversity and the ecosystems. Based on the available information, it is recommended that microbeads be considered toxic under subsection 64(a) of the Act. This would enable appropriate preventative measures to be taken to reduce the release of microbeads into the environment. As a precautionary next step, the Government of Canada is proposing to add microbeads to the List of Toxic Substances under the Canadian Environmental Protection Act, 1999 . Andrady, A. L. (2011). Microplastics in the marine environment. Marine Pollution Bulletin , 62 (8), 1596-1605. Arthur, C., Baker, J., Bamford, H. (2009). Proceedings of the International Research Workshop on the Occurrence, Effects, and Fate of Microplastic Marine Debris. Department of Commerce, National Oceanic and Atmospheric Administration, Technical Memorandum NOS-OR&R-30 . Asua, J. M. (2004). Emulsion polymerization: from fundamental mechanisms to process developments. Journal of Polymer Science Part A: Polymer Chemistry , 42 (5), 1025-1041. Au, S. Y., Bruce, T. F., Bridges, W. C., Klaine, S. J. (2015). Responses of Hyalella azteca to acute and chronic microplastic. Environmental Toxicology and Chemistry . Avio, C. G., Gorbi, S., Milan, M., Benedetti, M., Fattorini, D., d'Errico, G., Pauletto, M., Bargelloni, L. Regoli, F. (2015). Pollutants bioavailability and toxicological risk from microplastics to marine mussels. Environmental Pollution , 198 , 211-222. Bakir, A., Rowland, S. J., Thompson, R. C. (2014). Transport of persistent organic pollutants by microplastics in estuarine conditions. Estuarine, Coastal and Shelf Science , 140 , 14-21. Besseling, E., Wegner, A., Foekema, E. M., van den Heuvel-Greve, M. J., Koelmans, A. A. (2012). Effects of microplastic on fitness and PCB bioaccumulation by the lugworm Arenicola marina (L.). Environmental science & technology , 47 (1), 593-600. Bradford, S. A., Yates, S. R., Bettahar, M., Simunek, J. (2002). Physical factors affecting the transport and fate of colloids in saturated porous media. Water Resources Research , 38 (12), 1327. Brooks, B. (2010). Suspension polymerization processes. Chemical Engineering & Technology , 33 (11), 1737-1744. Browne, M. A., Crump, P., Niven, S. J., Teuten, E., Tonkin, A., Galloway, T., Thompson, R. (2011). Accumulation of microplastic on shorelines worldwide: sources and sinks. Environmental science & technology , 45 (21), 9175-9179. Browne, M. A., Dissanayake, A., Galloway, T., Lowe, D., Thompson, R. (2008). Ingested microplastic plastic translocates to the circulatory system of the mussel, mytilus edulis . Environmental science & technology, 42 , 5026-5031. Browne, M. A., Niven, S. J., Galloway, T. S., Rowland, S. J., Thompson, R. C. (2013). Microplastic moves pollutants and additives to worms, reducing functions linked to health and biodiversity. Current Biology , 23 (23), 2388-2392. Buchs, B., Evangelou, M. W., Winkel, L. H., Lenz, M. (2013). Colloidal properties of nanoparticular biogenic selenium govern environmental fate and bioremediation effectiveness. Environmental science & technology , 47 (5), 2401-2407. Castañeda, R. A., Avlijas, S., Simard, M. A., Ricciardi, A. (2014). Microplastic pollution in St. Lawrence River sediments. Canadian Journal of Fisheries and Aquatic Sciences , 71 (12), 1767-1771. Chern, C. S. (2006). Emulsion polymerization mechanisms and kinetics. Progress in polymer science , 31 (5), 443-486. Colabuono, F. I., Barquete, V., Domingues, B. S., Montone, R. C. (2009). Plastic ingestion by Procellariiformes in southern Brazil. Marine Pollution Bulletin , 58 (1), 93-96. Cole, M., Lindeque, P., Fileman, E., Halsband, C., Galloway, T. S. (2015). The Impact of Polystyrene Microplastics on Feeding, Function and Fecundity in the Marine Copepod Calanus helgolandicus. Environmental science & technology . Corcoran, P. L., Norris, T., Ceccanese, T., Walzak, M. J., Helm, P. A., Marvin, C. H. (2015). Hidden plastics of Lake Ontario, Canada and their potential preservation in the sediment record. Environmental Pollution , 204 , 17-25. Cózar, A., Echevarría, F., González-Gordillo, J. I., Irigoien, X., Úbeda, B., Hernández-León, S., Palma, A.T. , Navarro, S., García-de-Lomas, J., Ruiz, A., Fernandez-de-Puelles, M.L. Duarte, C. M. (2014). Plastic debris in the open ocean. Proceedings of the National Academy of Sciences , 111 (28), 10239-10244. Dale, A. L., Casman, E. A., Lowry, G. V., Lead, J. R., Viparelli, E., Baalousha, M. (2015). Modeling nanomaterial environmental fate in aquatic systems. Environmental science & technology , 49 (5), 2587-2593. Dantas, D. V., Barletta, M., da Costa, M. F. (2012). The seasonal and spatial patterns of ingestion of polyfilament nylon fragments by estuarine drums (Sciaenidae). Environmental Science and Pollution Research , 19 (2), 600-606. Darlington, T. K., Neigh, A. M., Spencer, M. T., Guyen, O. T., Oldenburg, S. J. (2009). Nanoparticle characteristics affecting environmental fate and transport through soil. Environmental Toxicology and Chemistry , 28 (6), 1191-1199.
de Sá, L. C., Luís, L. G., Guilhermino, L. (2015). Effects of microplastics on juveniles of the common goby (Pomatoschistus microps): Confusion with prey, reduction of the predatory performance and efficiency, and possible influence of developmental conditions. Environmental Pollution , 196 , 359-362. Dellinger, B., Pryor, W. A., Cueto, R., Squadrito, G. L., Hegde, V., Deutsch, W. A. (2001). Role of free radicals in the toxicity of airborne fine particulate matter. Chemical research in toxicology , 14 (10), 1371-1377. Desforges, J. P. W., Galbraith, M., Dangerfield, N., Ross, P. S. (2014). 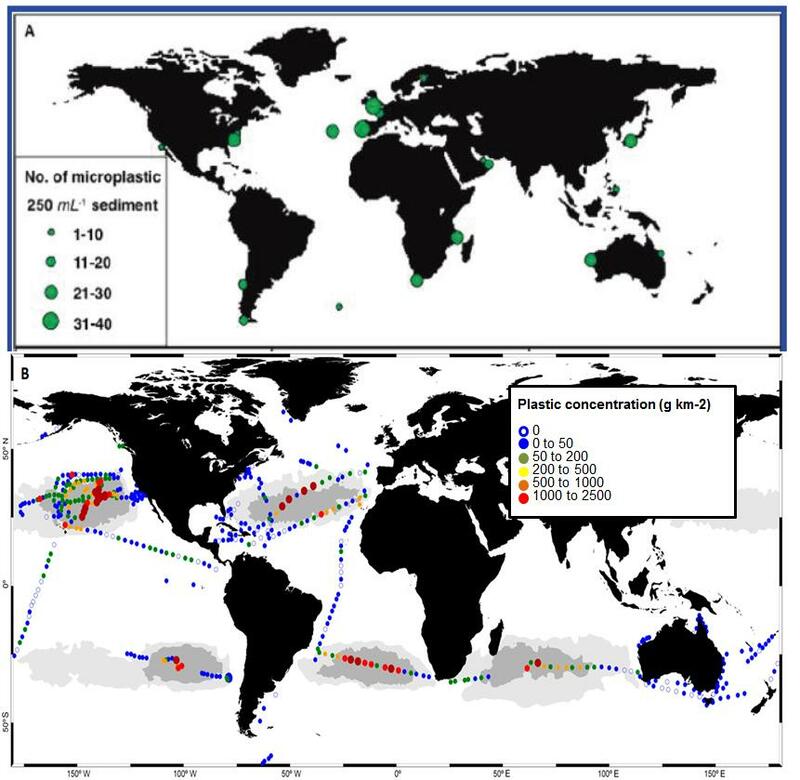 Widespread distribution of microplastics in subsurface seawater in the NE Pacific Ocean. Marine pollution bulletin , 79 (1), 94-99. DeSimone, J. M., Maury, E. E., Menceloglu, Y. Z., McClain, J. B., Romack, T. J., Combes, J. R. (1994). Dispersion polymerizations in supercritical carbon dioxide. Science , 265 (5170), 356-359. Dowding, P. J., Vincent, B. (2000). Suspension polymerisation to form polymer beads. Colloids and Surfaces A: Physicochemical and Engineering Aspects , 161 (2), 259-269. Dris, R., Gasperi, J., Tassin, B. (2014, January). Assessing the microplastics in urban effluents and in the Seine River (Paris). In Fate and impacts of microplastics in marine ecosystems . Eriksen, M., Lebreton, L. C., Carson, H. S., Thiel, M., Moore, C. J., Borerro, J. C., Galgani, F., Ryan, P.G. Reisser, J. (2014). Plastic Pollution in the World's Oceans: More than 5 Trillion Plastic Pieces Weighing over 250,000 Tons Afloat at Sea. PloS one , 9 (12), e111913. Eriksen, M., Mason, S., Wilson, S., Box, C., Zellers, A., Edwards, W., Farley, H. Amato, S. (2013). Microplastic pollution in the surface waters of the Laurentian Great Lakes. Marine pollution bulletin , 77 (1), 177-182. Eriksson, C., Burton, H. (2003). Origins and biological accumulation of small plastic particles in fur seals from Macquarie Island. AMBIO: A Journal of the Human Environment , 32 (6), 380-384. Fendall, L. S., Sewell, M. A. (2009). Contributing to marine pollution by washing your face: Microplastics in facial cleansers. Marine Pollution Bulletin , 58 (8), 1225-1228. Foekema, E. M., De Gruijter, C., Mergia, M. T., van Franeker, J. A., Murk, A. J., Koelmans, A. A. (2013). Plastic in North Sea fish. Environmental science & technology , 47 (15), 8818-8824. Fossi, M. C., Coppola, D., Baini, M., Giannetti, M., Guerranti, C., Marsili, L., Panti, C., de Sabata, E., Clò, S. Marine Environmental Research. 2014, 100, 17-24. Fry, D. M., Fefer, S. I., Sileo, L. (1987). Ingestion of plastic debris by Laysan Albatrosses and Wedge-tailed Shearwaters in the Hawaiian Islands. Marine Pollution Bulletin , 18 (6), 339-343. GESAMP. (2015). Microplastics in the ocean. Gouin, T., Roche, N., Lohmann, R., Hodges, G. (2011). A thermodynamic approach for assessing the environmental exposure of chemicals absorbed to microplastic. Environmental Science & Technology , 45 (4), 1466-1472. Graham, E. R., Thompson, J. T. (2009). Deposit-and suspension-feeding sea cucumbers (Echinodermata) ingest plastic fragments. Journal of Experimental Marine Biology and Ecology , 368 (1), 22-29. Hall, N. M., Berry, K. L. E., Rintoul, L., Hoogenboom, M. O. (2015). Microplastic ingestion by scleractinian corals. Marine Biology , 162 (3), 725-732. Haimer, J., Gutow, L., Koihler, A., Saborowski, R. (2014). Fate of Microplastics in the Marine Isopod Idotea emarginata. Environmental science & technology , 48 (22), 13451-13458. He, W. D., Sun, X. L., Wan, W. M., Pan, C. Y. (2011). Multiple morphologies of PAA-b-PSt assemblies throughout RAFT dispersion polymerization of styrene with PAA Macro-CTA. Macromolecules , 44 (9), 3358-3365. Hennigan, C. J., Miracolo, M. A., Engelhart, G. J., May, A. A., Presto, A. A., Lee, T., Sullivan, A. P., McMeeking, G. R., Coe, H., Wold, C. E., Hao, W.-M., Gilman, J. B., Kuster, W. C., de Gouw, J., Schichtel, B. A., Collett Jr., J. L., Kreidenweis, S. M, Robinson, A. L. (2011). Chemical and physical transformations of organic aerosol from the photo-oxidation of open biomass burning emissions in an environmental chamber. Atmospheric Chemistry and Physics , 11 (15), 7669-7686. Hidalgo-Ruz, V., Gutow, L., Thompson, R. C., Thiel, M. (2012). Microplastics in the marine environment: a review of the methods used for identification and quantification. Environmental science & technology , 46 (6), 3060-3075. Imhof, H. K., Ivleva, N. P., Schmid, J., Niessner, R., Laforsch, C. (2013). Contamination of beach sediments of a subalpine lake with microplastic particles. Current biology , 23 (19), R867-R868. Jambeck, J. R., Geyer, R., Wilcox, C., Siegler, T. R., Perryman, M., Andrady, A., Narayan, R. Law, K. L. (2015). Plastic waste inputs from land into the ocean. Science , 347 (6223), 768-771. Jeftic, L., Sheavly, S. B., Adler, E. (2009). Marine litter: a global challenge . N. Meith (Ed.). Regional Seas, United Nations Environment Programme. Jinhua, L., Guangyuan, Z. (2014). Polystyrene Microbeads by Dispersion Polymerization: Effect of Solvent on Particle Morphology. International Journal of Polymer Science , 2014 . Kaposi, K. L., Mos, B., Kelaher, B. P., Dworjanyn, S. A. (2014). Ingestion of microplastic has limited impact on a marine larva. Environmental science & technology , 48 (3), 1638-1645. Law, K. L. Thompson, R. C. (2014). Microplastics in the seas. Science , 345 (6193), 144-145. Lee, K. W., Shim, W. J., Kwon, O. Y., Kang, J. H. (2013). Size-dependent effects of micro polystyrene particles in the marine copepod Tigriopus japonicus. Environmental science & technology , 47 (19), 11278-11283. Leslie, H. A. (2014). Review of Microplastics in Cosmetics. Institute for Environmental Studies [IVM]. Leslie, H. A., van Velzen, M. J. M., Vethaak, A. D. (2013). Microplastic survey of the Dutch environment. Novel data set of microplastics in North Sea sediments, treated wastewater effluents and marine biota . Li, Y., Armes, S. P. (2010). RAFT synthesis of sterically stabilized methacrylic nanolatexes and vesicles by aqueous dispersion polymerization. Angewandte Chemie , 122 (24), 4136-4140. Lusher, A. L., McHugh, M., Thompson, R. C. (2013). Occurrence of microplastics in the gastrointestinal tract of pelagic and demersal fish from the English Channel. Marine pollution bulletin , 67 (1), 94-99. Machado, F., Lima, E. L., Pinto, J. C. (2007). A review on suspension polymerization processes. Polímeros , 17 (2), 166-179. Mathalon, A., Hill, P. (2014). Microplastic fibers in the intertidal ecosystem surrounding Halifax Harbor, Nova Scotia. Marine pollution bulletin , 81 (1), 69-79. Mato, Y., Isobe, T., Takada, H., Kanehiro, H., Ohtake, C., Kaminuma, T. (2001). Plastic resin pellets as a transport medium for toxic chemicals in the marine environment. Environmental science & technology , 35 (2), 318-324. Murray, F., Cowie, P. R. (2011). Plastic contamination in the decapod crustacean Nephrops norvegicus (Linnaeus, 1758). Marine Pollution Bulletin , 62 (6), 1207-1217. Napper, I. E. Thompson, R. C. (2015). Characterisation, Quantity and Sorptive Properties of Microplastics Extracted From Cosmetics. Marine Pollution Bulletin (in press). Nobre, C. R., Santana, M. F. M., Maluf, A., Cortez, F. S., Cesar, A., Pereira, C. D. S., Turra, A. (2015). Assessment of microplastic toxicity to embryonic development of the sea urchin Lytechinus variegatus (Echinodermata: Echinoidea). Marine pollution bulletin , 92 (1), 99-104. Obbard, R. W., Sadri, S., Wong, Y. Q., Khitun, A. A., Baker, I., Thompson, R. C. (2014). Global warming releases microplastic legacy frozen in Arctic Sea ice. Earth's Future , 2 (6), 315-320. Possatto, F. E., Barletta, M., Costa, M. F., do Sul, J. A. I., Dantas, D. V. (2011). Plastic debris ingestion by marine catfish: an unexpected fisheries impact. Marine Pollution Bulletin , 62 (5), 1098-1102. Quadros, M. E., Marr, L. C. (2010). Environmental and human health risks of aerosolized silver nanoparticles. Journal of the Air & Waste Management Association , 60 (7), 770-781. Rochman, C. M., Hoh, E., Kurobe, T., Teh, S. J. (2013). Ingested plastic transfers hazardous chemicals to fish and induces hepatic stress. Scientific reports , 3 . Rochman, C. M., Kurobe, T., Flores, I., Teh, S. J. (2014). Early warning signs of endocrine disruption in adult fish from the ingestion of polyethylene with and without sorbed chemical pollutants from the marine environment. Science of the Total Environment , 493 , 656-661. Rosenkranz, P., Chaudhry, Q., Stone, V., Fernandes, T. F. (2009). A comparison of nanoparticle and fine particle uptake by Daphnia magna. Environmental Toxicology and Chemistry , 28 (10), 2142-2149. Setälä, O., Fleming-Lehtinen, V., Lehtiniemi, M. (2014). Ingestion and transfer of microplastics in the planktonic food web. Environmental pollution , 185 , 77-83. Syberg, K., Khan, F. R., Selck, H., Palmqvist, A., Banta, G. T., Daley, J., Sano, L. Duhaime, M. B. (2015). Microplastics: addressing ecological risk through lessons learned. Environmental Toxicology and Chemistry , 34 (5), 945-953. Teuten, E. L., Rowland, S. J., Galloway, T. S., Thompson, R. C. (2007). Potential for plastics to transport hydrophobic contaminants. Environmental science & technology , 41 (22), 7759-7764. Teuten, E. L., Saquing, J. M., Knappe, D. R., Barlaz, M. A., Jonsson, S., Björn, A., Rowland, S.J., Thompson, R.C., Galloway, T.S., Yamashita, R., Ochi, D., Watanuki, Y., Moore, C., Viet, P.H., Tana, T.S., Prudente, M., Boonyatumanond, R., Zakaria, M.P., Akkhavong, K., Ogata, Y., Hirai, H., Iwasa, S., Mizukawa, K., Hagino, Y., Imamura, A., Saha, M. Takada, H. (2009). Transport and release of chemicals from plastics to the environment and to wildlife. Philosophical Transactions of the Royal Society B: Biological Sciences , 364 (1526), 2027-2045. Thompson, R. C., Olsen, Y., Mitchell, R. P., Davis, A., Rowland, S. J., John, A. W., McGonigle, D. Russell, A. E. (2004). Lost at sea: where is all the plastic?. Science , 304 (5672), 838-838. Van Cauwenberghe, L., Janssen, C. R. (2014). Microplastics in bivalves cultured for human consumption. Environmental Pollution , 193 , 65-70.
van Franeker, J. A., Bell, P. J. (1988). Plastic ingestion by petrels breeding in Antarctica. Marine Pollution Bulletin , 19 (12), 672-674.
von Moos, N., Burkhardt-Holm, P., Koihler, A. (2012). Uptake and effects of microplastics on cells and tissue of the blue mussel Mytilus edulis L. after an experimental exposure. Environmental science & technology , 46 (20), 11327-11335. Woodall, L. C., Sanchez-Vidal, A., Canals, M., Paterson, G. L., Coppock, R., Sleight, V., Calafat, A., Rogers, A.D., Narayanaswamy, B.E. Thompson, R. C. (2014). The deep sea is a major sink for microplastic debris. Royal Society Open Science , 1 (4), 140317. Zbyszewski, M., Corcoran, P. L. (2011). Distribution and degradation of fresh water plastic particles along the beaches of Lake Huron, Canada. Water, Air, & Soil Pollution , 220 (1-4), 365-372. Zbyszewski, M., Corcoran, P. L., Hockin, A. (2014). 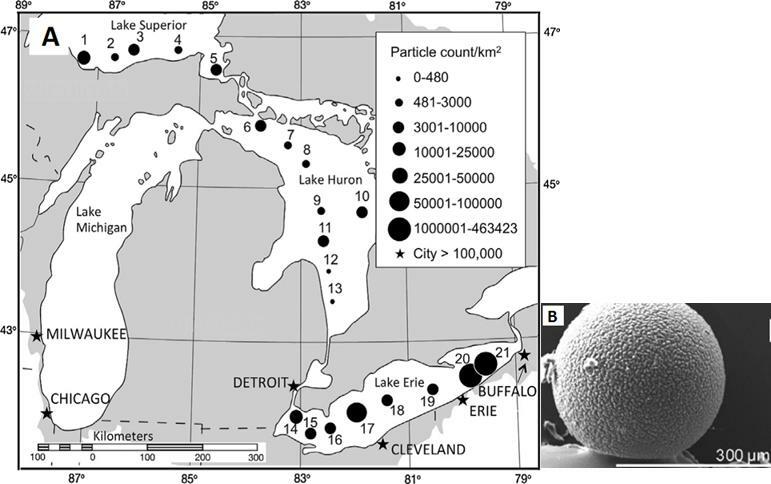 Comparison of the distribution and degradation of plastic debris along shorelines of the Great Lakes, North America. Journal of Great Lakes Research , 40 (2), 288-299. Zubris, K. A. V., Richards, B. K. (2005). Synthetic fibers as an indicator of land application of sludge. Environmental pollution , 138 (2), 201-211.